Small, fluid-filled bags known as “minibags” have been in short supply for years. Now, hospitals are feeling even more compromised from the shortage ever since production at Baxter facilities in Puerto Rico was hampered in September by Hurricane Maria. Baxter International makes a significant portion of I.V. solution products for the U.S. market. “Clearly this has a huge impact on hospitals as well as home infusion pharmacies and infusion centers since many medications given by the I.V. route are mixed into these bags and given by infusion,” said Matthew Grissinger, RPh, from the Institute for Safe Medication Practices (ISMP). 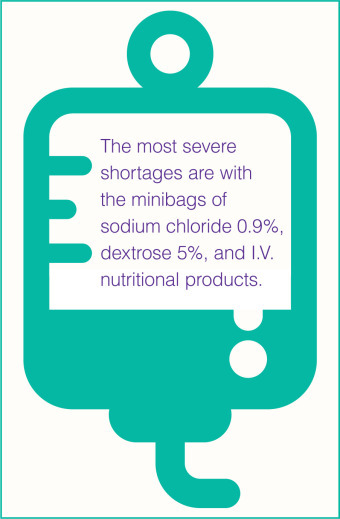 The most severe shortages are being felt with small-volume parenteral solutions, such as the 50-mL and 100-mL minibags of sodium chloride 0.9%, dextrose 5%, and I.V. nutritional products made by Baxter, according to the American Hospital Association (AHA). As this article went to press, the American Society of Health-System Pharmacists (ASHP) had been hearing from both large and small hospitals alike that they had only a 1- to 2-week supply of small-volume parenteral solutions left. ASHP has been working around the clock to identify solutions and strategies for facilities (see sidebar on page 33). FDA is monitoring a list of about 30 critical drug products that are either manufactured solely or primarily in Puerto Rico. Of those 30 drugs, 14 are sole-source products, meaning there are no alternatives available. FDA was not able to provide the exact list of medications it’s monitoring. According to written testimony made by FDA Commissioner Scott Gottlieb during an October Congressional hearing, about 8% of the medications Americans consume (based on the dollar value of pharmaceuticals) are manufactured in Puerto Rico, including blood fraction products, cardiovascular drugs, and treatments for cancer and HIV. More than 80 pharmaceutical companies have facilities on the island. To mitigate the shortage of I.V. solution products, FDA is doing something it rarely does: importing products from overseas plants. In this case, FDA is allowing temporary importation of an alternative supply of sodium chloride 0.9% injection bags, dextrose 5% injection bags, and metronidazole injection into the United States from Baxter facilities in Ireland, Australia, Mexico, and Canada. Deborah Pasko, PharmD, ASHP’s director of medication safety and quality, said there has been no release date or date of delivery for these shipments, however. “At this point, everyone is running short, so the importation will not alleviate the issue until the products can actually be delivered to hospitals—and this timeframe remains elusive,” she said. FDA said it undergoes a complex process of review when it imports drugs from overseas. This includes evaluating the overseas formulation, labeling, and other attributes as well as the quality of the manufacturing sites. Any differences from the approved version are outlined in a letter shipped with the drug and posted on FDA’s website. When U.S.-approved firms don’t have supplies from additional sites to redirect to the U.S. market, the agency is able to work with regulatory counterparts in countries such as Canada, Australia, and the European Union on potential, temporary drug sources. In fact, FDA has done this on 37 different occasions in the past 7 years. In addition, FDA said it is working with other U.S. companies that make I.V. saline solution products, and the agency will also expedite review of any new product applications that will assist with the shortage. Baxter has sent multiple “Dear Customer” letters indicating what drugs are manufactured in Puerto Rico and may be running low soon. However, drug manufacturers are under no mandate to notify FDA, although they are encouraged to do so. In a recent letter to a Congressional subcommittee, ASHP, AHA, and other organizations urged Congress to examine how the pharmaceutical industry communicates information about what drugs are manufactured at which plants and where those plants are located. During the October Congressional hearing, Gottlieb said that if drug manufacturing facilities in Puerto Rico don’t return to the electrical grid by the end of 2017, the United States could face multiple potential drug shortages. The question of turning to compounding was raised by Rep. Buddy Carter (R-GA), BSPharm, during the hearing. He asked if drugs on FDA’s shortage list could be compounded by pharmacies. Gottlieb replied that FDA doesn’t typically consider compounding as an alternative solution to shortages; the agency is more likely to try sourcing the drug from overseas manufacturing facilities that are inspected by FDA. Currently, FDA and Congress disagree on the ability of compounding pharmacies to provide compounded medications during the ongoing drug shortage situation, said Shawn Hodges, PharmD, International Academy of Compounding Pharmacists board member. “The FDA actions in implementing the Drug Quality and Security Act (DQSA) contrary to Congressional intent have decreased patient access and further impeded the ability of compounding pharmacists to effectively compound medications for providers and health systems to be administered to patients.” The practice is often termed “office-use.” Hodges explained that before FDA implemented the DQSA, many states authorized the practice of traditional state-licensed pharmacists to provide compounded medications to health care providers and facilities for administration to patients. Where can pharmacists go to get updates and guidance on a current drug shortage? ASHP has posted all known information from the manufacturers, Utah’s Drug Information Center, and FDA at www.ashp.org/shortages. ASHP offers the guidance document “Small-Volume Parenteral Solutions Shortages, Suggestions for Management and Conservation,” which is also available on FDA’s main drug shortage page: www.fda.gov/Drugs/DrugSafety/DrugShortages. Pharmacists who have questions can contact ASHP’s Center for Medication Safety and Quality at quality@ashp.org. If more shortages occur, especially with oral medications, the effect on the outpatient or community pharmacy could be pronounced. ISMP’s Grissinger relayed an example involving furosemide 20-mg tablets. He played out the scenario for pharmacists if these 20-mg tablets were no longer available from any manufacturer: pharmacies would have to find an alternative method, for example, offering the 40-mg tablets and instructing patients to split them in half. Because it would be a new prescription, pharmacists would need to obtain permission from each patient’s physician for the temporary switch. “In addition, [pharmacists] have to worry about whether the insurance company will allow for the switch, depending on the drug. So for each patient affected by a drug shortage, there could be several steps taken for each patient affected by one drug’s shortage,” said Grissinger. © 2017 American Pharmacists Association. Published by Elsevier Inc. All rights reserved.